Society’s failure to explore and utilize ingenuity of special children was highlighted at an event to mark World Social Work Day in Kumasi. Sociologist Dr. John Boulard Forkuor believes it is partly to blame for Ghana’s slow pace of realizing her full economic potential. He spoke at the Community Special Vocational School at Deduako where the ceremony took place. Deduako Community Special School is one of only two second-cycle facility for graduates from all schools for persons with special needs in Kumasi. It was established as a private institution in 2002 and absorbed by the government in 2005. Students are required to undergo three years of skills training in tailoring and dress-making, leatherwork and bead making, among others. Sociologist, Dr John Boulard Forkuor says the country stands to lose if we neglect these potentials. “These special children are into so many things. If we accept them, we can harness their limitless potential and this can really boost the economy of Ghana,” he said. The 2019 edition highlights ‘Promotion of Importance of Human Relationships’. It is the key day in the year social workers worldwide stand together to celebrate the achievements of the profession. They take the theme message into their communities, workplaces, and governments. It is aimed at raising awareness of the social work contributions and need for further action. This year’s theme focuses on the social relationships between people’s essential relationships with each other, their environments and their futures. 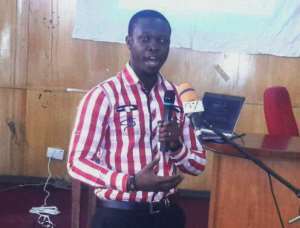 National organizer of the Ghana Association of Social Workers, Moses Gyasi observes a gradual breakdown of family and workplace as a result of poor relationships. According to him, this has long term implications on productivity. “We no longer have the community meetings which we used to have which brings us together, there’s a breakdown in the family and workplace” he lamented. Association of Social Work students took the opportunity to interact with the special students to create awareness of the importance of social inclusion. “We’ve come here to interact with them to make them understand they are also part of us,” said Enoch Amponsah, Vice President of Association of Social Work Students.